Please see Part B below, for details of the brands which are we referring to, when we refer to ‘FUTURE OF GHANA’. See Part C below for an explanation of some of the capitalised terms we use. The Privacy & Cookies Policy contains important information about how we handle and process the Personal Information, which we collect from you – please read it carefully. If you are reading this Privacy & Cookies Policy online, please print or save a copy for your records. By accessing, using or registering on the Website or FUTURE OF GHANA Social Media, downloading, using or registering on a Mobile App, contacting Guest Services or applying for, signing, using or registering as a FUTURE OF GHANA member or using any of the FUTURE OF GHANA Services, you acknowledge that you have read, and agree to the provisions of, the Privacy & Cookies Policy. Where there are important changes to the Privacy & Cookies Policy, we will inform you by either prominently posting a notice, or emailing you, to let you know that the Privacy & Cookies Policy has been updated. However, we will only use your Personal Information for the purposes for which we collected it, which includes contacting you in the future for our marketing and advertising purposes, including without limitation to inform you about FUTURE OF GHANA services or events we believe might be of interest to you, to develop promotional or marketing materials and provide those materials to you, and to display content and advertising on or off the Services that we believe might be of relevance to you. If we need to use your Personal Information for an unrelated purpose, we will notify you and we will explain the lawful basis which allows us to do so. Please note though, we will only process your Personal Information in other circumstances without your knowledge or consent, where this is required or permitted by law. Future of Ghana provide information, advice, events and volunteering services under the FUTURE OF GHANA company in the UK. “GDPR” means the General Data Protection Regulation (as updated from time to time). “Guest Services” means any Guest Services facility operated by third parties including Eventbrite. “FUTURE OF GHANA Social Media” means the parts of social media provided by third parties (such as Linkedin Instagram, Facebook) through which FUTURE OF GHANA provides services such as information, applications and similar activities. – “Personal Information” has the same meaning as ‘personal data’ under the GDPR. This in essence means any information about an individual from which that person can be identified. It does not include data where the identity has been removed (anonymous data). – “Website” means our website at www.futureofghana.com as well as any other websites operated by any FUTURE OF GHANA brand. 13.1. Identity Information – this consists of identity information, and may include: first name; last name; user name and password, as well as similar identifiers; title; date of birth; age; health, medical or disability status; photographs. 13.2. Contact Information – this consists of contact information, and may include: billing address; delivery address; email address; and telephone numbers. 13.3. Financial Information – Any credit/debit card payments and other payments you make through our Site will be processed by our third party payment providers and the payment data you submit will be securely stored and encrypted by our payment service providers using up to date industry standards. Please note that we do not ourselves store the debit/credit card data that you submit. 13.4. Transactional Information – this consists of details about payments to, and from, you; usage of points, vouchers, memberships and gift cards; and other details of products and services which you have purchased from us. 13.5. Technical Information – this consists of technical browser or device related information, and may include: your device type; internet protocol (IP) address; your session data; browser type and version; time zone setting; and location data. 13.6. Profile Information – this consists of profile data about you, and may include: your interests; your preferences; your feedback; survey responses; information about how you use the FUTURE OF GHANA Services. 13.7. 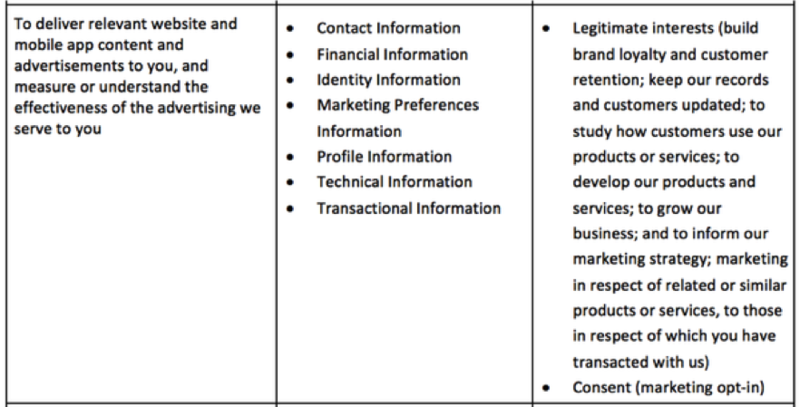 Marketing Preferences Information – this consists of your preferences in receiving marketing from us and our third parties, and your communication preferences. 13.8. Other Information – this is other Personal Information which you voluntarily choose to share with us; as well as CCTV footage and photography when you enter our premises and / or attend our events. 15.2. Food allergy information for FUTURE OF GHANA hosted events. 15.3. Complaints or queries where consumers of their own volition, provide health, medical or disability information; we will not process such information, unless it is applicable to the respective complaint or query. 15.4. Accident, injury or incident reports. Where we need to collect Personal Information by law, or under the terms of a contract which we have with you (or we are intending on entering into with you), and you fail to provide that information when requested, then we may not be able to perform the contract we have, or are trying to enter into. In this case, we may not be able to provide you with the respective product or service, or we may have to cancel a product or service you have with us, but we will notify you if this is the case at the time. If you make a purchase, FUTURE OF GHANA will collect the information which we need to fulfil your order and notify you of the status of your order. You need to be 18 or over to set up an account with us. If you set up an account with us FUTURE OF GHANA will collect the information which we need to open, administer and run your account, and to deal with any enquiries which you may have about it. The joining process will set out the minimum information which you will need to provide (in the form of mandatory fields) and you may provide us with other relevant information if you chose. If you want to join our membership network, you will need to join, completing the mandatory registration information form. Once joining through registration, we will automatically give you a My FUTURE OF GHANA account or equivalent, so that you can manage your memberships and use the Website though your My FUTURE OF GHANA account. When setting up an account with FUTURE OF GHANA, we will collect information about your marketing preferences, and you can update your marketing preferences using your account settings. FUTURE OF GHANA will obtain the Personal Information which you submit, when you enter a competition or promotion on the Website, Mobile App or using FUTURE OF GHANA Social Media. From time to time, we may contact you by email to ask you to participate in a user survey, where you have consented to such communications. Participation in surveys is completely voluntary, and we will collect such Personal Information as you provide in respect of any such surveys. FUTURE OF GHANA may collect information about your use of our services. 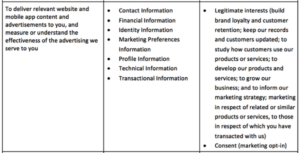 We may also collect information about marketing communications we send to you and how you respond to them. See Part F below, for more details about this. FUTURE OF GHANA is the controller in respect of its own cookies only. If you are using Mobile Apps, then certain functionality requires location data from your device to work. If you do not want the Mobile Apps to use your location data, please change your settings on your device; some Mobile Apps ask you if you want to do this when you download them (e.g. iPhone apps), or depending on your device, others may ask you when you access them (e.g. FUTURE OF GHANA mobile website). If you change your mind and want to opt out later, you will need to change the settings on your Mobile App. 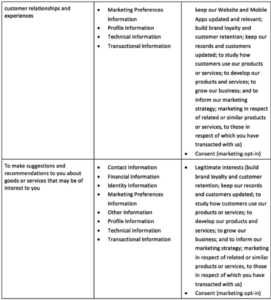 Please see the relevant help sections for your device for more information in this regard. FUTURE OF GHANA Social Media may allow you to see your friend’s details and contact them. An example of this would be our Event Planner within Facebook. Where this is the case, this function is provided by the social media site provider and not FUTURE OF GHANA. FUTURE OF GHANA does not hold your friend’s details. Any messages which you send to friends via FUTURE OF GHANA Social Media, use the relevant social media’s functionality and are not sent from FUTURE OF GHANA. The Website, Mobile Apps and FUTURE OF GHANA Social Media may contain links to websites which are not controlled by FUTURE OF GHANA. This might include a link in a third party advertisement. The fact that the Website, Mobile Apps and FUTURE OF GHANA Social Media provide links to any such website, does not mean that FUTURE OF GHANA endorses that website or any of the services or products it offers. We are not agents for any such websites or advertisers, and we are not authorised to make representations on their behalf (unless explicitly stated). FUTURE OF GHANA is not responsible for the privacy practices of any such websites. You provide Personal Information to such websites at your own risk, and you should check their privacy policies accordingly. 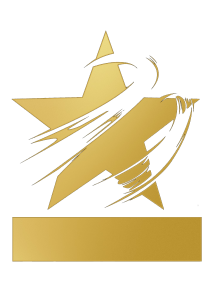 35.4. To protect your, or a third party’s, vital interests (i.e. medical emergency situations). 36.3. Processing special categories of Personal Information in relation to health, medical or disability information, which you choose to provide to us (to the extent that this is not required for complying with a legal or regulatory obligation). You have the right to withdraw consent at any time by contacting us (contact details are shown in Part L below), or in respect of cookies, following the directions referred to in the Cookies Policy. If you make a purchase, FUTURE OF GHANA will use your information to fulfil your order and notify you of the status of your order, which for online purchases will usually include sending you a booking or purchase confirmation email (this will be undertaken pursuant to our contractual performance obligations). 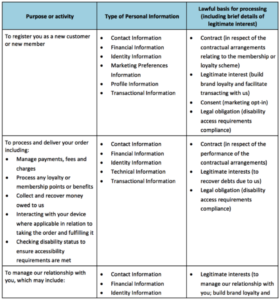 Details of your purchases will be linked to you (and your membership account), in order to provide any applicable loyalty points (in accordance with our contractual arrangements) or membership benefits (pursuant to our legitimate interests), as well as to generate a profile of the types of purchases which you prefer (again, pursuant to our legitimate interests), so that we can send you more targeted (and therefore relevant) advertising, information and offers. We may also use anonymised information derived from this, for statistical and trend analysis purposes. If you apply to join the FUTURE OF GHANA Brands (e.g. Membership Network) we will use your information to open, administer and run your account and to deal with any enquiries you may have about it (such activities will be undertaken in accordance with our contractual arrangements, to the extent that they relate to contractual performance, whilst other activities will be undertaken pursuant to our legitimate interests). 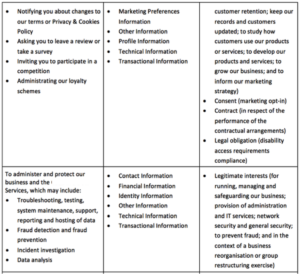 We have set out below, in a table format, a further description of certain ways in which we may use your Personal Information, and which of the lawful bases we rely upon to do so. We have also identified both in the table and in the Privacy & Cookies Policy, what our legitimate interests are where appropriate. Please note, that we may process your Personal Information on more than one lawful ground, depending on the specific purposes for which we are using your Personal Information. Please contact us if you need details about the specific lawful ground which we are relying upon, to process your Personal Information, where more than one ground has been set out in the table below. In the other provisions of Part F, we have included further details of how we may use your Personal Information, as well as details of our legitimate interests where appropriate. 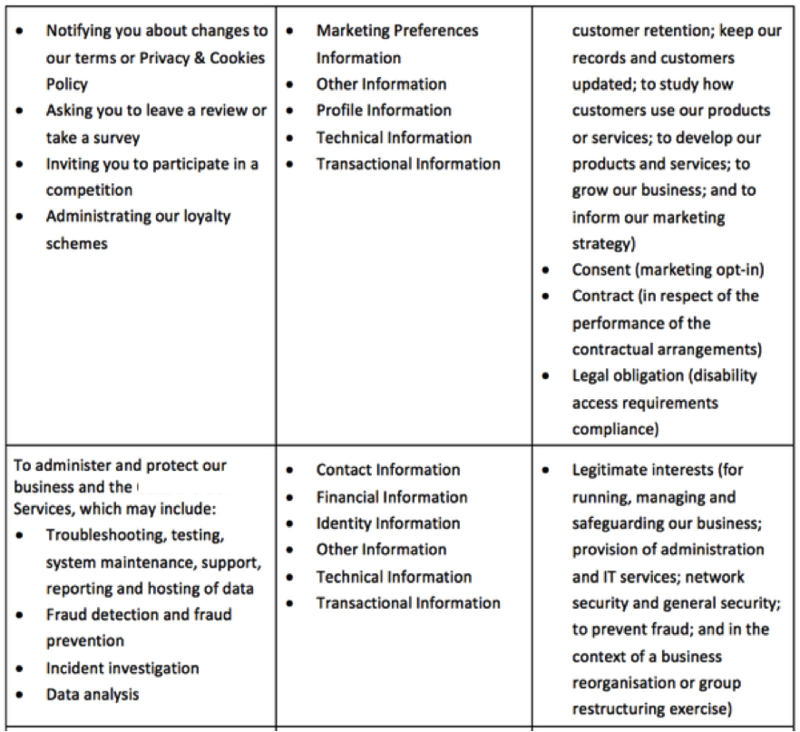 The lawful bases for such processing (where they are not addressed in the above table), will be: consent in respect of marketing communications (where we have stated that we are not relying upon legitimate interests); contract in respect of contractual performance, or taking steps at your request prior to entering into a contract; legal requirements in respect of health and safety statutory requirements, and in respect of disability status (to ensure appropriate access requirements are fulfilled); vital interests in respect of medical emergencies; and legitimate interests for other purposes. 42.7. To build up a picture of your personal preferences, and generally how you use the FUTURE OF GHANA Services, and so allow us to customise your visits to our Website, Mobile Apps and FUTURE OF GHANA Social Media and any marketing communications which we send to you. If you are over 18, we may send you marketing communications if you have consented to this, or, when you have transacted with us, we may send you marketing communications pursuant to our legitimate interest, in respect of related or similar FUTURE OF GHANA products or services. FUTURE OF GHANA marketing communications will be about Ghana related news, promotions, opportunities, competitions and special offers, as well as information about FUTURE OF GHANA products and services. We will send marketing communications through the communication methods which you have opted into. Marketing messages will only come from FUTURE OF GHANA / FUTURE OF GHANA Brands as noted above. They may include information on carefully selected partners from time to time, but we will NEVER pass your Personal Information to any third party for direct marketing. Where we provide you with news and offers of organisations outside FUTURE OF GHANA, we do not give them your identity details. If you have a FUTURE OF GHANA Member account (which includes all members of FUTURE OF GHANA and you are receiving email marketing communications from us) you can log into your account to amend your email marketing message preferences. Every information email from FUTURE OF GHANA will contain details of how you can unsubscribe, and you can always contact us to unsubscribe using the methods set out at Paragraphs 72 to 73 below. Survey information will be used for the purposes of understanding customer trends, monitoring or improving our services and, sometimes, to contact you with news and offers. This will be provided to you where you have opted into such surveys by way of consent. 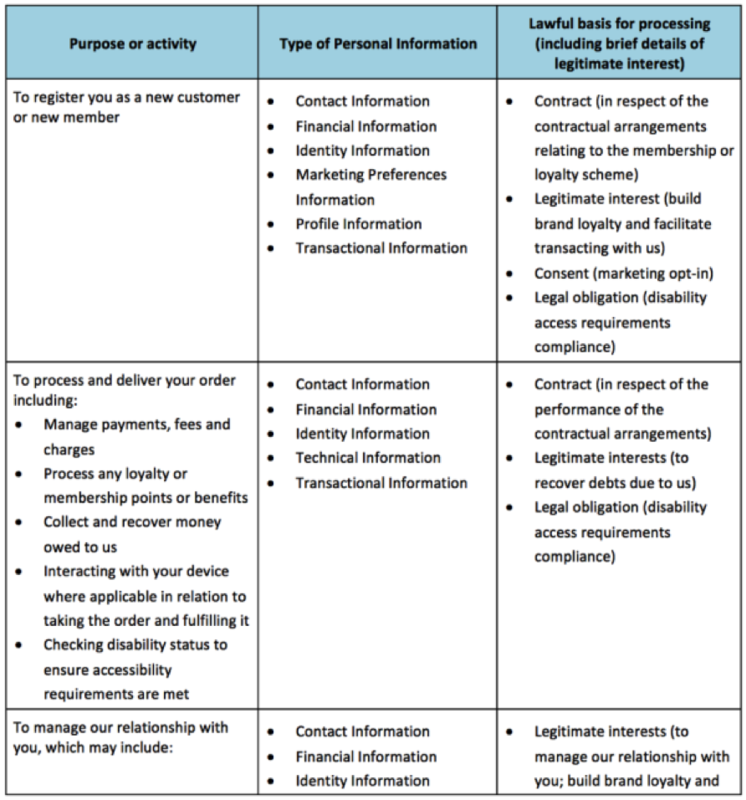 If you provide us with special categories of Personal Information, such as that relating to a disability, we will use this for the purpose of providing you with access to our goods and services, in a manner which takes into account such disability (pursuant to our legal obligation to address such accessibility requirements). We would also like to refer you to Paragraph 15, for further details in respect of our collection and processing of special categories of Personal Information. We will use the data which we collect when you use FUTURE OF GHANA Wi-Fi, in order to provide you with access to the FUTURE OF GHANA Wi-Fi service. We use CCTV systems in our premises, for our legitimate interests (and for those of our customers, visitors, business partners and service providers) of detecting, investigating and addressing incidents (including health and safety, civil or criminal unlawful acts). This is to safeguard our premises, business, goods and services, as well as our customers, visitors, business partners and service providers. Footage from CCTV may be used by: us; the third parties referred to in this paragraph; by our representatives or those of our third parties; the police; or health and safety investigators; in detecting, investigating and addressing any incidents. 51.2. Other companies and individuals in order for them to perform functions on our behalf (e.g. developing, maintaining and analysing customer databases; creating, sending out and analysing customer communications; administering competitions; developing, maintaining and analysing the FUTURE OF GHANA Services and providing customer services; and operating our FUTURE OF GHANA membership). Where we transfer your Personal Information (name and email address) to service providers which are acting as our processors, we will do so, on the basis that the respective third parties have agreed with us, that they with comply with the appropriate GDPR safeguards, including that they have in place adequate technical and organisational measures to protect the respective Personal Information, will not pass it on to any other party (without our explicit approval and only with valid grounds), and will not use it for any purpose other than to provide us with advice or perform the function specified on our behalf. We also reserve the right to release Personal Information without your consent, or without consulting you, when we believe that this is appropriate to comply with our legal obligations, to enforce our terms and conditions or other legal rights, to protect the security of the FUTURE OF GHANA Services, to prevent fraud, or otherwise to protect the legitimate interests of FUTURE OF GHANA or its customers. From time to time, we may share statistical information about customers with third parties such as advertisers, business partners and sponsors, to help us and them analyse, develop, manage and market our goods and services. This information will be shared in a way that ensures that your identity is not revealed to them. 55.2. We may share a unique identifier with third parties and their partners, in order for these third parties and their partners to identify you as a registered user of their services. Such third parties and their partners then use this information to send you advertising and promotions about FUTURE OF GHANA products and services on their websites and mobile services. The use of your information by such third party service providers is governed by their privacy policies, and any applicable consents that you have provided to such third party service providers, where such consents are required by applicable law. The nature of the Internet is such that we cannot guarantee the security of the information which you transmit to us via the Internet, and any transmission over the Internet is at your own risk. We follow strict security procedures, so that Personal Information is processed in a manner that ensures appropriate security of the Personal Information, including appropriate protection against unauthorised or unlawful processing and against accidental loss, destruction or damage, using appropriate technical or organisational measures. We store information which you provide to us, on secure servers, and payment transactions are encrypted using SSL technology. We will notify you, and any applicable supervisory authority, of a Personal Information breach, where we are legally required to do so. If you choose, or are provided with, a user name, user identification code, password, security question and answer, verification number or any other piece of security information as part of our security procedures, you must treat such information as confidential and not disclose it to any third party. If you become aware of any unauthorised use of your security information, you must inform us immediately. We have the right to disable any account and registration with us at any time, if in our opinion, you have failed to comply with your obligation to keep your security information secure. We will only retain your Personal Information for as long as is necessary, to fulfil the purposes which we collected it for, including for the purposes of satisfying any legal, accounting, or reporting requirements. For tax and legal claims purposes, we retain Transactional Information (with the associated Identity Information and Contact Information to the extent required for such purposes) for six years after an individual ceases being a customer. In some circumstances we may anonymise your Personal Information (so that it can no longer be associated with you) for research, trend analysis, or statistical purposes, in which case we may use this information indefinitely without further notice to you. The Personal Information that we collect from you, may be transferred to, and processed at, a destination outside the European Economic Area (“EEA”). It may also be processed by staff operating outside the EEA who work for us or one of our suppliers. Such staff may be engaged in, amongst other things, fulfilment of your order, provision of support or administration services, analysis of statistical data, or other functions as referred to in the Privacy & Cookies Policy. By submitting your Personal Information, you agree to this transfer, storing or processing. 65.3. Where we use providers based in the USA, we may transfer Personal Information to them, if they have agreed to comply with the Privacy Shield, which requires them to provide similar protection to Personal Information shared between Europe and the USA. (further details in respect of such safeguards are available from: https://ec.europa.eu/info/law/law-topic/data-protection/data-transfers-outside-eu/eu-us-privacy-shield_en). Under certain circumstances, you have rights under data protection laws in relation to your Personal Information. If you wish to exercise these rights, in order to assist us with promptly dealing with them, we would request that you direct them, using the contact details shown in Paragraph 74 below. 67.1. Request access to your Personal Information (commonly known as a “subject access request”). This enables you to receive a copy of the Personal Information which we hold about you, and to certain details in respect of the processing of such Personal Information. 67.2. Request correction of the Personal Information that we hold about you. This enables you to have corrected, any incomplete or inaccurate data which we hold about you, though we may need to verify the accuracy of the new data which you provide to us. 67.3. Request erasure of your Personal Information. This enables you to ask us to delete or remove Personal Information where there is no good reason for us continuing to process it. You also have the right to ask us to delete or remove your Personal Information, where you have successfully exercised your right to object to processing (see below), where we may have processed your information unlawfully, or where we are required to erase your Personal Information to comply with local law. Note, however, that we may not always be able to comply with your request of erasure for specific legal reasons which will be notified to you, if applicable, at the time of your request. 67.4. Object to processing of your Personal Information where we are relying on a legitimate interest (or those of a third party), and there is something about your particular situation which makes you want to object to processing on this ground, as you feel it impacts on your fundamental rights and freedoms. In some cases, we may demonstrate that we have compelling legitimate grounds to process your information which override your rights and freedoms. You also have the right to object where we are processing your Personal Information for direct marketing purposes. 67.5. Request restriction of processing of your Personal Information. This enables you to ask us to suspend the processing of your Personal Information, in the following scenarios: (a) if you want us to establish the data’s accuracy; (b) where our use of the data is unlawful but you do not want us to erase it; (c) where you need us to hold the data even if we no longer require it, as you need it to establish, exercise or defend legal claims; or (d) you have objected to our use of your data, but we need to verify whether we have overriding legitimate grounds to use it. 67.6. Request the transfer of your Personal Information to you or to a third party. We will provide to you, or a third party you have chosen, your Personal Information in a structured, commonly used, machine-readable format. Note that this right only applies to automated information which you initially provided consent for us to use or where we used the information to perform a contract with you. 67.7. Withdraw consent at any time where we are relying on consent to process your Personal Information. However, this will not affect the lawfulness of any processing carried out before you withdraw your consent. You will not have to pay a fee to access your Personal Information (or to exercise any of the other rights referred to in Paragraph 67 above). However, we may charge a reasonable fee if your request is clearly unfounded, repetitive or excessive. Alternatively, we may refuse to comply with your request in these circumstances. We may need to request specific information from you, to help us confirm your identity and ensure your right to access your Personal Information (or to exercise any of your other rights). This is a security measure to ensure that Personal Information is not disclosed to any person who has no right to receive it. We may also contact you, to ask you for further information in relation to your request, to speed up our response. We try to respond to all legitimate requests within one month. Occasionally it may take us longer than a month, if your request is particularly complex or you have made a number of requests. In this case, we will notify you and keep you updated. It is important that the Personal Information which we hold about you, is accurate and current. Please keep us informed if your Personal Information changes during your relationship with us. If you want to modify or update your registered details at any time, you can do this by logging in to the Website. 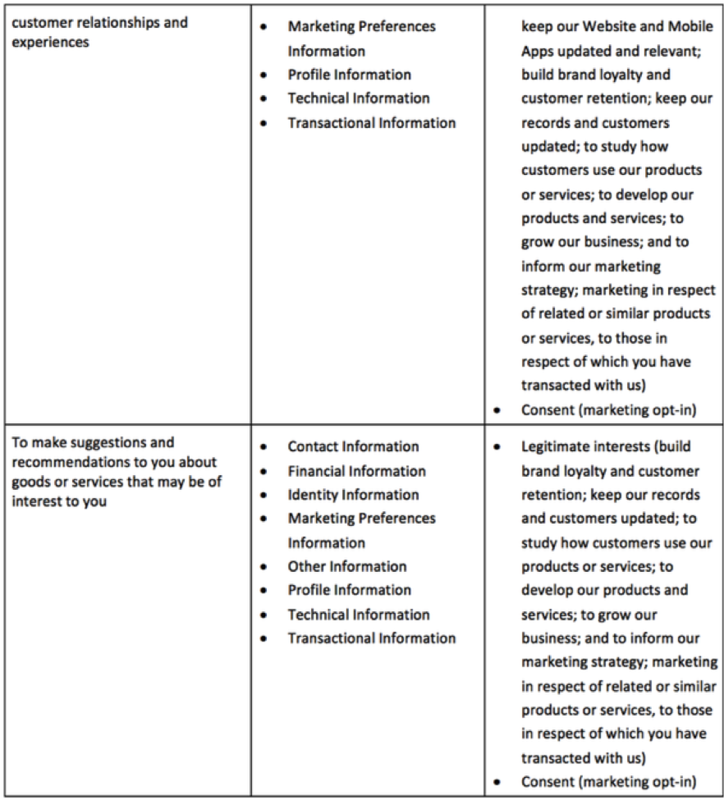 Alternatively, you may inform us by any of the methods set out at Paragraph 73 below, of any changes in your Personal Information or marketing message preferences, and we will update or modify your Personal Information accordingly. You also have the right to make a complaint at any time, to the Information Commissioner’s Office (“ICO”), the UK supervisory authority for data protection issues (www.ico.org.uk). We would, however, appreciate the chance to deal with your concerns before you approach the ICO, so we would be grateful if you would please contact us in the first instance. © Future of Ghana Limited 2015 – 2018. All rights reserved.